I can’t believe the hubs and I have been married for over 9 months now! Time does fly when you are having fun ;). I feel blessed to be married to an amazing man and I just love hearing him call me his “wife”. Today’s post is dedicated to my husband/talented photographer/person who puts up with me and all of my ideas. He’s my tall and handsome rock. 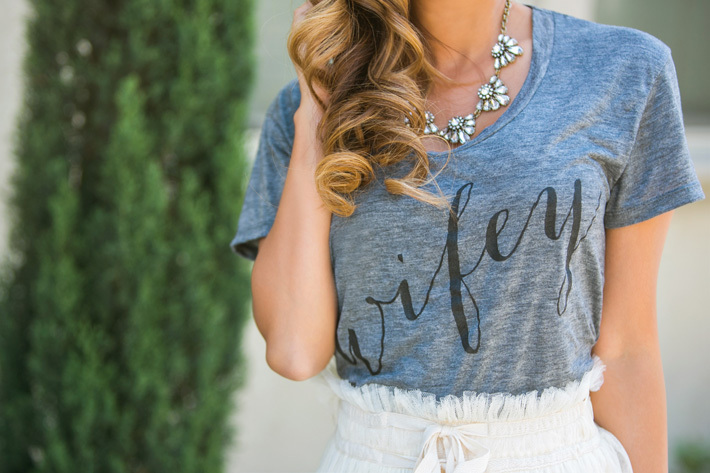 This wifey tee from Ily Couture is so darling and I love pairing unexpected things together like with this gorgeous tulle midi skirt from my boutique, Morning Lavender. I also threw on this favorite new shoes of mine from Joe’s which almost felt like a ballerina with the tulle skirt. This look definitely puts some fun and glamour into the term “wifey” :).